The government is to move ahead with plans which will pave the way for the Royal Mint to be privatised. 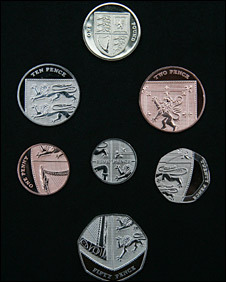 The Mint, which produces all UK coins, is based in Llantrisant in South Wales. The Treasury said it was being given company status in preparation for an injection of private cash to "pursue further commercial opportunities". Unions and politicians accused the government of "selling off the family silver", saying the move would lead to job losses among the 70 staff. The change, revealed in the Treasury's Operational Efficiency Programme said there was "now a strong case for the introduction of private capital into the Royal Mint". "This will best allow the business to pursue further commercial opportunities and grow, taking advantage of the resources and opportunities which come from moving outside the public sector." As well as producing UK currency and commemorative sets, it also makes completed coins, and blank coins, for other countries. The privatisation would allow it to win more of those contracts, the Treasury said, adding it would "cement the Royal Mint's position as a high-quality British manufacturing success, competing and winning in global markets". "Vesting" the Mint to give it company status was started in 2004 but then stopped due to its poor performance. Once resumed, the process should be completed by the end of 2009, the Treasury report said. Plaid Cymru said that the decision to vest the Mint now that it had been turned around, was wrong. "It appears they are saying that if a public business makes a profit then it should be privatised," said the party's treasury affairs spokesman Adam Price. And the Public and Commercial Services Union said that the "so-called efficiency savings are spending cuts which we fear will result in real people with bills to pay and mouths to feed losing their jobs". General secretary Mark Serwotka added: "We have seen the impact of botched privatisations and IT outsourcing in areas such as passports, the Criminal Records Bureau and Tax Credits, resulting in the government bailing out the private sector at a cost of millions to the taxpayer." But Royal Mint chief executive Andrew Stafford welcomed the move. "We have a strong strategy, strong team and strong order book in place and I believe that vesting will facilitate further growth, and better secure the future sustainable success of the business for our staff and customers," Mr Stafford said. "It will allow us to pursue further commercial opportunities and expand more rapidly, taking advantage of the freedoms and flexibilities which come from a move to company status, thus confirming our position as a high-quality British manufacturer and the world's leading exporting mint."